Gaiman, N. (2008). The graveyard book. New York: HarperCollins. Intended audience: Mid-teens and up. 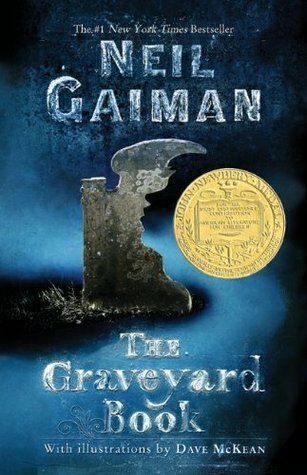 Personal reaction to the book: Neal Gaiman is a genius (I keep writing that in reviewing his work). I was wondering what made this a YA book, but when I thought about it, it’s a simple story of a boy making his way in the world, until he becomes a young man. It’s also a charming, chilly, gothic tale of a little boy raised by those ghosts and what he learns along the way. As for the rest of us … we don’t know Jack. Originally published in 2007, this edition has wonderful black-and-white drawings by Dave McKean; not so many a reader can’t create their own vision of the world, but enough to really add to the atmosphere (as if a foggy graveyard full of active ghosts isn’t atmospheric enough). I am less fond of the graphic novel edition, which does not match McKean’s (or my) vision well at all. Author facts: A self-described “feral child who was raised in libraries,” Gaiman credits librarians with fostering a life-long love of reading. His first book was a Duran Duran biography and his second was a biography of Douglas Adams (author of Hitchhiker’s guide to the galaxy). Gaiman writes for all ages, working in text and in comics, as well as screenwriting.